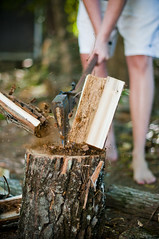 Do you hand cut your trees and then split your own firewood with an axe or a sledge and a wedge? Listen, while I understand that the exercise is great, you’re not Charles Ingles and this isn’t the 1800’s! Maybe it’s time to introduce a little technology and save your back for all of the other things that need to get done? Are you a modern day pioneer, taking advantage of a little technology and splitting your firewood with a wood splitter? I am! In fact, when I was a kid my father got his hands on an old (and I mean old) Onan floor polisher and used it to fabricate a really slick horizontal wood splitter. That was probably a good 30 years ago, and the family has been taking turns splitting their own wood each summer in order to restock the firewood supplies. Check out the old Onan powered wood splitter in action. I know that it may not be the most advanced or efficient design, compared to some of the competition these days, but you have to give the old Onan engine credit considering that it’s probably pushing 50 or 60 years old by now. It runs great, gets the wood split, and saves wear and tear on my back. It would be nice though, if it had a hydraulic log lift or bi-directional splitting capability like this Tempest. If you can’t afford to own your own wood splitter, you can rent them from almost any equipment rental place. Trust me, it’s worth it! Do you split your own firewood? Do you rent or own a wood splitter? Leave me a comment and let me know! This entry was posted in Pioneer Life, Sustainable Living, Technology and tagged Pioneer Life, Sustainable Living, urban farming by Todd Bryan. Bookmark the permalink. I love to cut & chop my own firewood by hand (well, I cut it down with a chainsaw). Cutting my blocks & splitting by hand gives me something fun to do outside when it is below zero. Very cool Angela! That will definitely keep you in good shape. Without log splitter which tools I can use for getting better efficiency? is it maul or axe? Howard, for splitting by hand, I’d say a maul. Otherwise you have to use a sledge and and wedge. This is so exciting to me! amazing compilation of great informative ideas. Thank you for sharing it, as I found it was a very difficult and tough task for me to split a log myself. I usually prefer electric log splitter, but now after going through this amazing post, I can easily burn it myself.